Did you know that there was such a thing as a vegetarian spider? Yeah, I know... total shocker isn't it? Anyways, one of the titles grabbed my interest. Vegetarian Spider. I said the the lad... hey... what do you know about a vegetarian spider? His response was what? mom, spider don't eat plants. Yeah, well this ebook says.. Vegetarian Spiders. Want to check it out? So I"m going to add a learning a new language to the lad's skill set this year.This is what I'm considering. Or another I just discovered French Essentials. Which I'll do I"m just not certain at this point. Not in a rush, probably won't start until mid-October or so. On Friday I'm doing a guest post on Sarah's blog. My joyfilled life. It will be part of the ABC's of homeschooling series. I am so pleased I was able to be part of this. :) So go check out Sarah's blog and enjoy your time there. See you Friday! This book surprised me. I order it fromBooksneeze because no one else was really reviewing it and I figured someone aught to. BUT... oh my, I enjoyed this book. John Christopher Frame is the author of it, and it's published by Zondervan. The entire title is "Homeless at Harvard: finding faith and friendship on the streets of Harvard Square". This book is about John as a divinity student and how he took 10 weeks to live the life of a homeless person. He learned alot about life from the various people he spent time with. In this book he writes the stories of the people he met, sharing the viewpoint of being homeless and about life. PAY ATTENTION to the chapter titles... I frequently don't, but learned that in this book, if you don't pay attention to the titles, you won't know who is talking. Do you get answers for what you should do about homelessness? Not really. But John repeatedly talks about the importance of relationship. That relationship needs to occur as you help. Only through good relationships will you learn what people truly need in their homelessness. He also talks directly about the misconceptions people have about homelessness and how we need to face those ideas if we are going to help those that we aught to be helping. It's a good read. Seriously. You will read touching, personal stories about the people that he met, most of them men. You will read how he wasn't truly homeless because he could just leave when he wanted to. You will see and smell and understand more about the grab the street has on some people. How homelessness affects a body, and just how helpful people can be...just because they can be. We read three more books at lunch today. The Amazing world of spiders taught us new things about spiders. The fact that they have an oil on their skin that keeps them from sticking to their web. 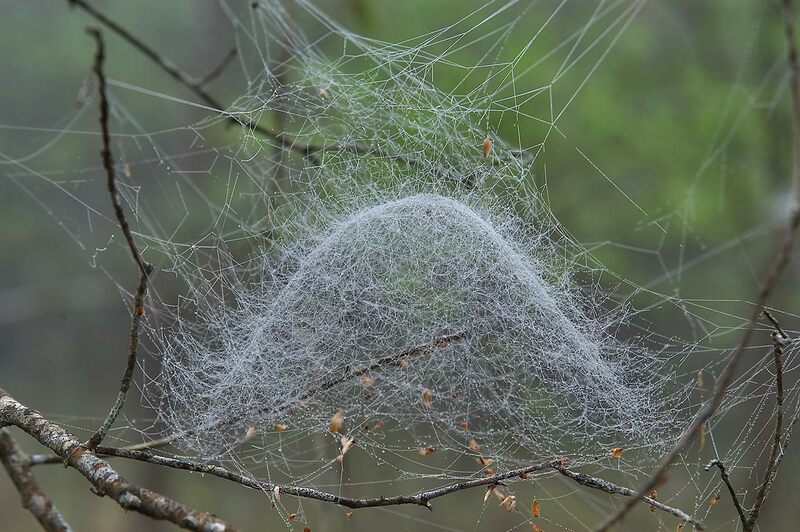 And that there are two main kinds of spiders...hunting and web-building, and we discovered a new type of web we didn't know before called a dome web. click on picture to go to source of image. Spider Web images. The Jillian Jiggs book made us laugh out lough. It was fun, filled with rhymes, and had a surprise ending. The lad says "this one is a keep book mom". The grouchy ladybug was okay to read. It wasn't great, it wasn't horrid either. It would be excellent in a teaching situation to learn about sizes and also as a remind that being nice is not a bad thing to be. Grouchy doesn't really get you anywhere except perhaps wet, tired and hungry. What else have we been doing lately? We continue to do some math drills... no more than 10 minutes, so far the lad is beating most of the drills easily. It is giving me a good sense of what he knows and what I need to work on a bit with him. Good to do now before we get to set on what we are doing. We're are working on Time4Learning. This is a review that we are doing. He was happy today to very much improve on his reading speed for a piece that he needed to do. :) It helped him to see that practicing does help when it comes to reading. I'm happy that he's gotten a boost of confidence. We continue to work our way through Bible study guide for all ages. This is a product we reviewed a bit back. It is a good fit for our family...and has gotten my boy willing to sing. :) The only issue I have with it, is that it is geared for groups and sometimes working around the group aspect is beyond me. MOM, I want to know: Do plants use bugs to carry their seeds? Since I"m not allowed to eat today, during breakfast I took my concentration off food by reading books to my lad. We read the following books"
MOM, are there any plants that use bugs to move their seeds around? I said, I don't think so but I don't know. I know birds and animals are used by plants, and people too, but I don't know about bugs. So we looked it up. Did you know that ants are beneficial in helping move seeds around? Do Insects help with seed dispersal? When it comes to insects, only the ants have been found to play significant roles in seed dispersal, in an interaction called myrmecochory. The few plants that use ants as seed dispersers produce seeds with an elaiosome – a tasty covering that ants love. The ants carry this seed back to the nest where they feed on the elaiosome, leaving the seed itself unharmed, and the seed lies dormant until conditions are ideal enough for germination. That had us looking up Myrmecochory. from Greek myrmeco-: "ant's" + -chory: "dispersal") is seed dispersal by ants, an ecologically significant ant-plant interaction with worldwide distribution. And Elaisosome (Greek élaion "oil" and sóma "body") are fleshy structures that are attached to the seeds of many plant species. The elaiosome is rich in lipids and proteins, and may be variously shaped. Many plants have elaiosomes that attract ants, which take the seed to their nest and feed the elaiosome to their larvae. Both of these definitions are from wiki. Isn't it cool how God has plants and animals work together in such a beneficial way? Rather cool too, how we never would have learned this if I hadn't been hungry and needed to distract myself from food. :) God works in mysterious ways doesn't he? There are over 3000 plants that use this technique to disperse their seeds. Here is a study that goes into further detail. It plays an important part in the lifecycle of cacti. I received a copy of this book From Bookcrash in order to give my fair and honest review. This book is written by Pam Forester, who leads you through her system of bible study and the reason why she uses her method. Do you know what? I LOVE the concept of this book. Spend one month studying one chapter of the bible, doing it in five minute segments. How much easier could that be for a busy mom? It couldn't be easier could it? And it is easy? YES. Read the book of Colossians on the way through once or twice and then every day read chapter three again, and every day find something new in the chapter to meditate on. I LOVE that aspect of it, but I have to say it left me wanting. I wanted more. I didn't want to be limited to that five-ten minutes per day. I didn't want to only have one small concept to think on. This book does what it says it will do. It will give the busy mom a quick break into the word of God and will leave her with things to ponder on throughout the day and more importantly.. it will leave her wanting more of God. So I became a Twitter follower of Pat Frayne who is the author of the Topaz the Cat series of books. You can find these books at Smashwords and on Amazon. Anyways, it turned out that Pat was looking for someone to review her books so I said that I would. SO in return for my review she sent me "Topaz and the Evil Wizard". My intent was to read it while on vacation with my son. This is a book written for children, so as I read it I kept that in mind, would I want my son to read this book? And if I did, what questions might I want him to have. I found myself overall interested in the story. It is a book about a cat with special powers, who is a friend of the king, who discovers children are going missing in the kingdom. As he finds out why they have gone missing he learns that their evil nemesis has somehow made a return and needs to be defeated again. The animals and fairies need to work together to defeat the evil wizard Dominance. Would I recommend this book to others to read? I don't know. It may just be me but I wasn't overly impressed. I read the book because I promised that i would do so, but if it had been one borrowed from the library I most likely would have just returned it unfinished. I didn't feel captured by any of the characters and really didn't care to know how it finished. (It does finish with good triumphing over evil). My son made me smile today. First let me get you some history. One of the last days that our international student was here, he picked up our "O Canada" book that the lad and I have been using to try to learn the words to "O Canada" (our national anthem). He wanted to know if we could sing it correctly. So tonight the lad keeps coming to me as I'm folding the laundry. "Mom," as he points to a word "what's this word say?" He'd disappear again, and then come back "Mom, what's this word?" Then we sang it together. Click link to go to origin of picture. As I read our stories tonight, he leafed through the book a bit, then asked, "MOM, why are there so many Canada images in this book"? .. because it's a book about Canada bud. "Oh, that makes sense then MOM." I said, that would be a great idea. :) And it would, wouldn't it? Imagine... a tender pork roast, simmering all afternoon in the crock pot, filling the house with the sweet smell of cranberries...THAT's what I experienced this afternoon. These next three ingredients only needed if thickening the gravy. 2 combine the next five ingredients. Pour it over the meat. 5.Skim fat from juices. Measure 2 cups, adding water if necessary. Pour into saucepan. Bring to boil over medium heat. Combine cold water with cornstarch until it is a paste. Stir into gravy. Cook and stir until thickened. Season with salt. 6. serve with sliced pork.